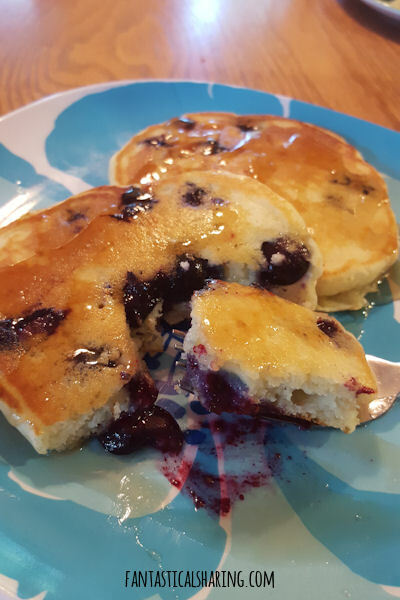 Perfect homemade blueberry pancakes that are buttery and have a hint of lemon to brighten them up. I really love making homemade pancakes because they really aren't too many more steps than making them from a box. I personally love all sorts of pancakes including plain ones and fruit pancakes and dessert pancakes. I was excited to try these pancakes. They aren't fluffy like some of the other homemade pancakes I have made, but that isn't a bad thing. They are so buttery and remind me of pancakes I used to get with my mom from our hometown diner when I was a kid. They just kind of melt in your mouth. I love the little zip you get from the lemon zest. It really ties it all together. Sift together flour, sugar, baking powder, baking soda, and salt in a large mixing bowl. In another large bowl, whisk together the eggs. Then add milk, sour cream, half the melted butter, and vanilla. Whisk to combine. Make a well in the dry ingredients and pour egg mixture into the well. Whisk until just combined and then fold in blueberries and lemon zest. Heat a large griddle or skillet over medium heat and coat with some of the remaining melted butter. Pour 1/4 cup of batter per pancake and let bubble on top before flipping to cook on the other side. Remove when both sides are golden brown. These Hazelnut Pancakes are made with coffee creamer and are one of my favorite ways to make pancakes. Bet you can't say this ten times fast: Whole Wheat Blueberry Pancakes with Healthy Grain Clusters and a Cinnamon Greek Yogurt Drizzle. But who needs to say it when you're eating it?! I can't wait to make this recipe from Bake at 350.